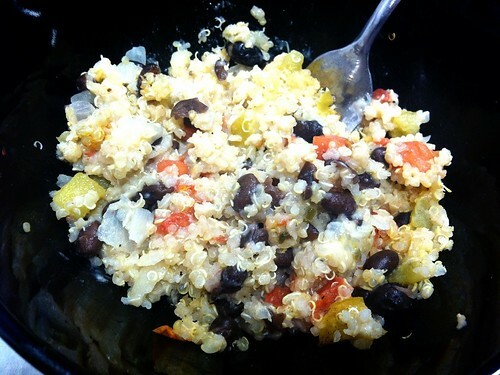 Here’s a roundup of all the interesting/different/boring food I ate this week. There was a party at work Wednesday night (I wasn’t invited, thank god), but I did get to take advantage of the leftover food. 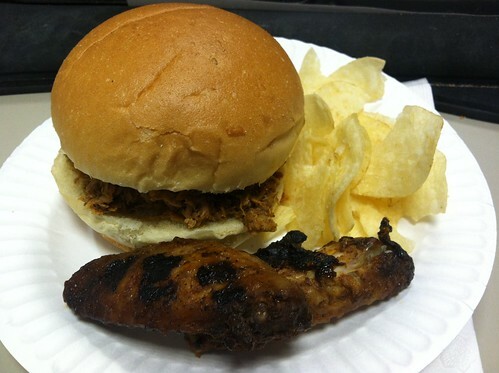 I had a pulled pork sandwich and potato chips (I ended up not eating the chicken wings, I took a bite of one and it was too rubbery). So good, so filling. 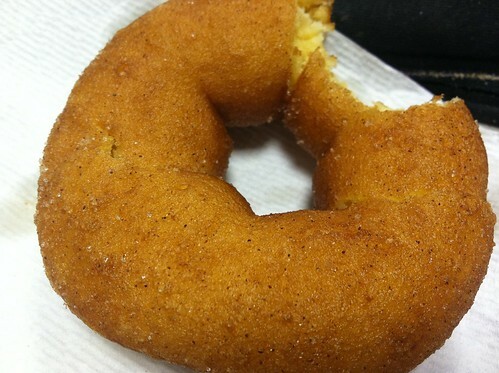 Apple cider doughnut from the Greenmarket courtesy of our IT director. What is better in the fall? We had a little Octoberfest celebration at work for the second year in a row. 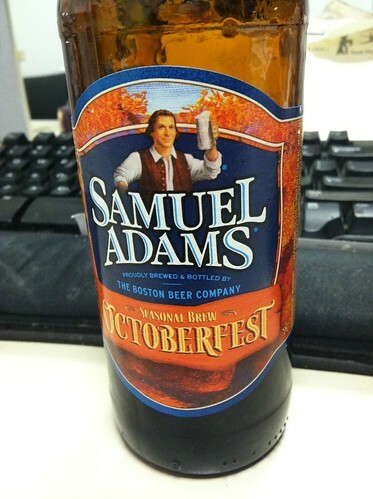 Sam Adams Octoberfest beer reminds me so much of college. It was the first “real” beer I ever drank (not Bud Lite or the crap we’d have in high school). It brings me right back to my first year of college. 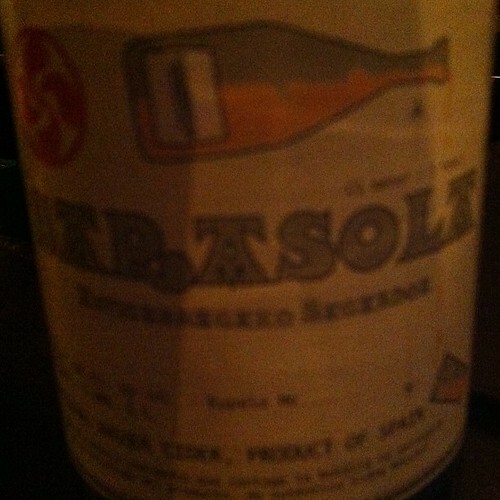 This is a really terrible picture, I know, of the hard cider I had at a wine bar Friday night. I ordered it because their wines were all really expensive. The bartender poured a little for me to try and I thought it was very odd, but I wasn’t sure if I liked it or not. So I tried more and decided I really liked it. It was super vinegary, but still good. I could only have one glass though. 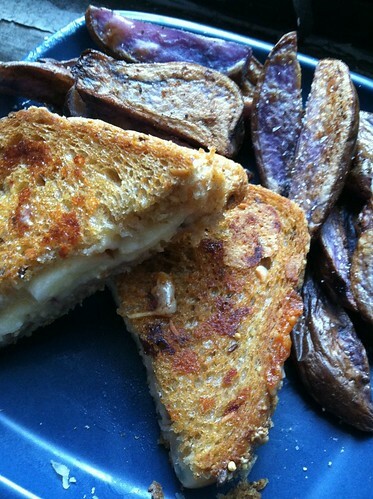 Lunch on Sunday, a grilled cheese and apple sandwich (on 9-grain organic bread from Bread Alone) and roasted blue potatoes. 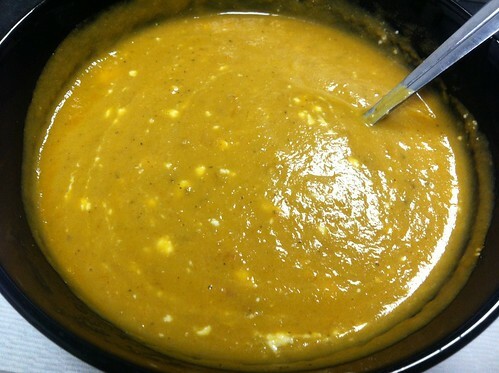 This is the roasted eggplant soup I’m eating for lunch this week. I like it, but I don’t love it. I would prefer it a little thicker. And there’s a certain flavor I don’t love, I added a teaspoon of cumin and a teaspoon or coriander. But it’s a good lunch, I like the suggestion someone made in the comments of adding tahini instead of cream, I might make it again and try that. And I’d probably add more garlic, no such thing as too much roasted garlic. I had this for a treat on Sunday night while watching Homeland. 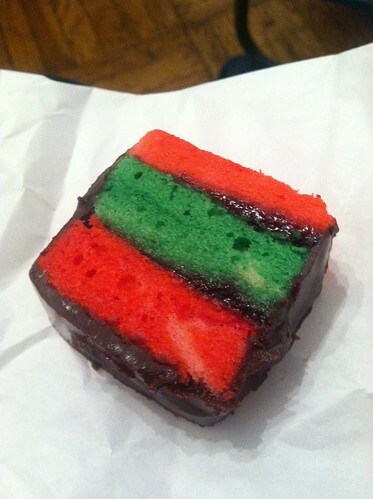 It’s supposed to be a rainbow cookie, but it was kind of blah. I got it from Trois Pommes, where I’ve gotten good and bad things before. It needed more almond paste and to be more moist, it was very dry. 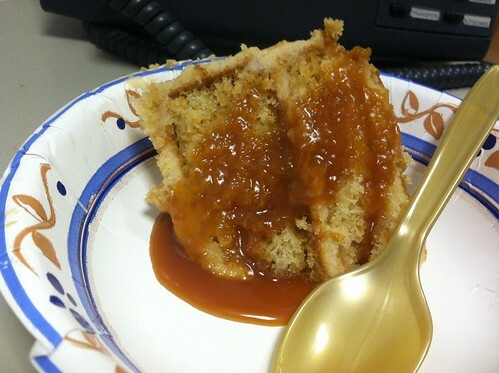 A co-worker made this caramel cake (I’m pretty sure it’s from this cookbook) and brought it in on Monday. It was amazing. I highly recommend it. Finally, the lasagna soup I made for dinners this week. I didn’t remember to snap a picture of it, and the leftovers are already frozen, but I really enjoyed it. I ended up using fat-free ricotta, but if I made it again I would use the full-fat. Also, I didn’t put mozzarella on top, that made it too high in calories, but next time I might not do the parmesan/ricotta mix and just do the mozzarella instead. Really, anything with Trader Joe’s spicy Italian chicken sausage is delicious. I wanted to post this yesterday, but then I realized I needed a picture of the pasta I’ve been eating for dinner, so let’s just pretend it’s Wednesday. Here’s my recap of what I’ve made this week. This Friday night dinner was a serious favorite. I needed to pull something together from what I had at home. I had two little chicken breasts leftover from something so I breaded those with an egg I added some hot sauce to and panko bread crumbs. Then I pan fried them (just a little Kerrygold butter) and then topped them with blue cheese and more hot sauce (leftover from the buffalo chicken chili). Like a healthier boneless wing. 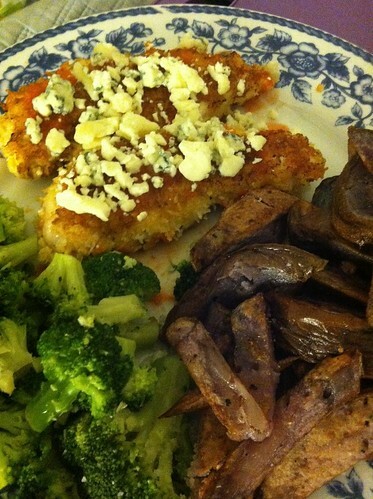 Plus some steamed broccoli and roasted blue potatoes. 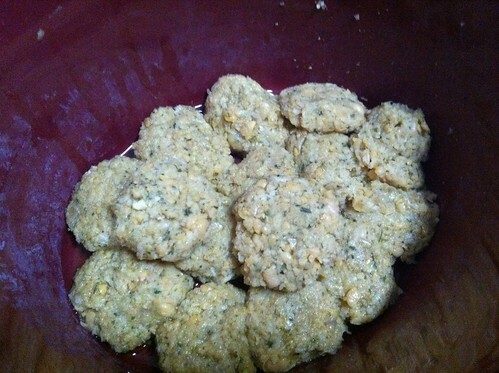 Next, crockpot falafel. These are before they were cooked. These were, unfortunately, not a winner. The recipe said it was fine to overlap them, but it wasn’t. Any part touching another falafel didn’t cool. And they did not get even remotely crispy. They taste fine, but the texture is so terrible I don’t think I’ll find them. When I felt so sick on Monday I couldn’t bring myself to eat falafel. So I went and bought these Stacy’s pita chips. 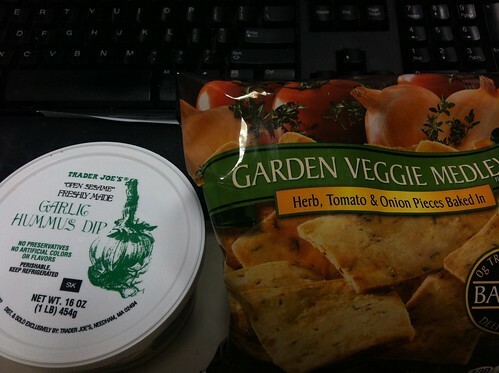 I had never tried the garden veggie medley ones and they are GOOD! I’ve had way too many of those with hummus over the last few days. 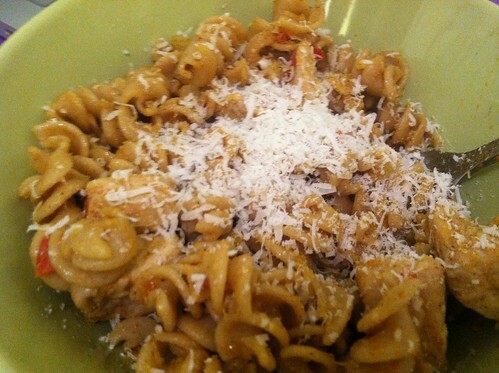 Finally, lightened up creamy cajun chicken pasta. I ended up using 8oz. of pasta rather than 6oz. so I made four servings. I thought a pound of chicken between three servings seemed like a lot. I didn’t increase the sauce at all so it wasn’t really saucy, but I still really liked it. This is definitely a winner. I had a great time hosting Fitblog last night and I am so thankful to everyone who participated in the chat. I was super nervous going into it, my blog doesn’t have a big following and scheduling conflicts have made me miss the last month or so of chats. But it went so well. If you have an idea and you’re not sure if you should do it, just do it! The only bad thing is that you have a while between submitting your proposal (I think I submitted mine in June), being picked to host (July), and actually hosting (last night). So if you’re like me you have lots of time to feel anxious about it. But it was worth it, I’m already trying to think up another proposal. Anyway, let’s talk about food. I’ve been adding my planned meals to the week to Monday’s posts, but then I never go back and talk about them. Let’s change that. This is the buffalo chicken chili. I honestly don’t know if I like it. I used ground turkey instead of chicken (because Trader Joe’s doesn’t have ground chicken) and I cut the recipe in half. 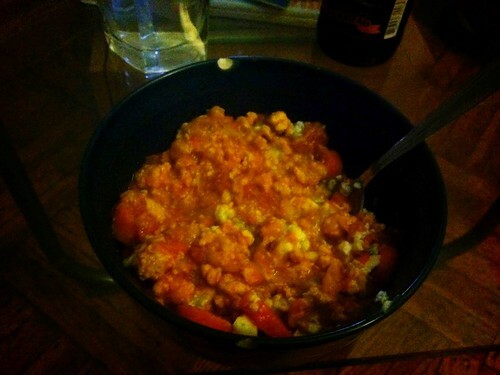 There are definitely way too many carrots and overall I think it kind of just tastes and has the texture of mealy tomatoes. But sometimes I like it. 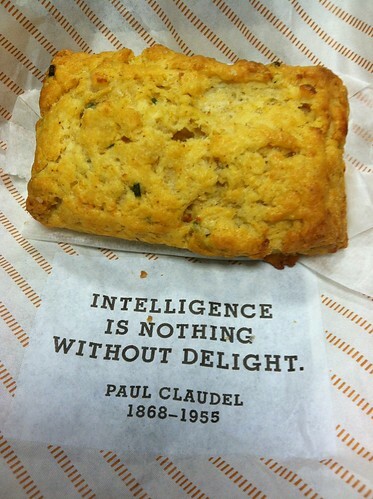 The crumbled blue cheese definitely improves it. If I were to make it again I might use boneless chicken breasts, cook them in buffalo sauce, and then shred them. And I would definitely incorporate celery. Maybe I’ll try my hand at it some day. This is the Mexican stuff pepper. Where’s the pepper you ask? In the garbage. Peppers do not warm up well in the microwave, note to self. I’m annoyed I wasted money on peppers, but the filling is fantastic. It almost tastes like a chipotle burrito. I don’t know why, but it does. The only change I made to the recipe, besides putting the kabash on pepper, was adding pepperjack cheese instead of a combo of cheddar and Monterrey jack. Oh and while I cooked the peppers in enchilada sauce I didn’t top it with the sauce, it turns out I don’t like enchilada sauce. 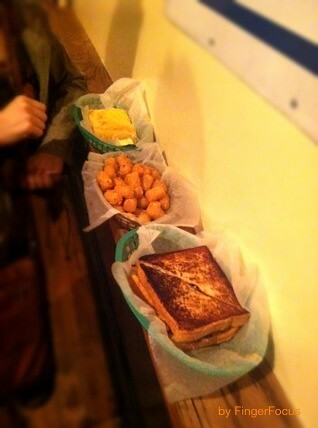 I didn’t make this, but late night unhealthy bar food definitely deserves a mention. After my roommate Abby’s birthday party on Saturday night we made a 1am stop at Pork Slope for food. I have been dying to go since I heard they had tater tots. My two roommates and I ended up splitting a pulled pork sandwich (I ate a quarter of it), tater tots (definitely ate more than a quarter of those), cornbread, and coleslaw. The pulled pork sandwich was phenomenal. The pork was perfectly cooked, the sauce was very tasty and there wasn’t too much of it, the bread was perfectly toasted and buttery, and even the pickles (which I normally hate) were great. The tater tots were delicious and perfectly crispy. The cornbread was ok, I think I’ve made better cornbread and the butter that came with it tasted weird, too sweet creamy for me (but my roommate liked it). And the coleslaw was fine, I was happy it didn’t have mayo and I love vinegar so all was well. 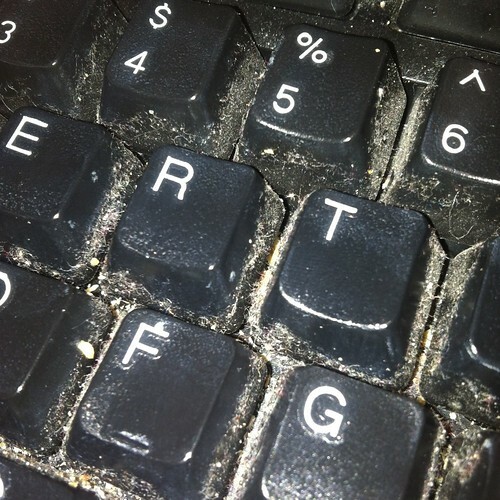 Finally, when I went to edit those pictures on my phone I opened Line Camera which automatically opened to the camera and zoomed in on my keyboard below. How disgusting is that? What is wrong with me? I’m off to find some canned air. And happy birthday to my dad! A year away from retirement!